We were up this morning bright and early (more like dark and early) to catch the first bus down into the city to get the the train station. Our train was scheduled to depart at 8:39 but with the fiasco of missing the train the other day we didn’t want to take any risks so we left earlier so that we would be sure we had enough time. We arrived at the station about 40 minutes before it was scheduled to depart and grabbed breakfast at the cafe in the station (this morning was yogurt with granola and a chocolate muffin). I then noticed there was a McDonalds and wanted to see what they had to offer. It was setup similar to the other coffee shops in that there was a place to order caffe and a place to order pastries, but then at a separate counter they had a place to order “McDonald’s” – I put that in quotes because there were no steak, egg and cheese bagels, it was more like tomato, egg and spinach on an English muffin! 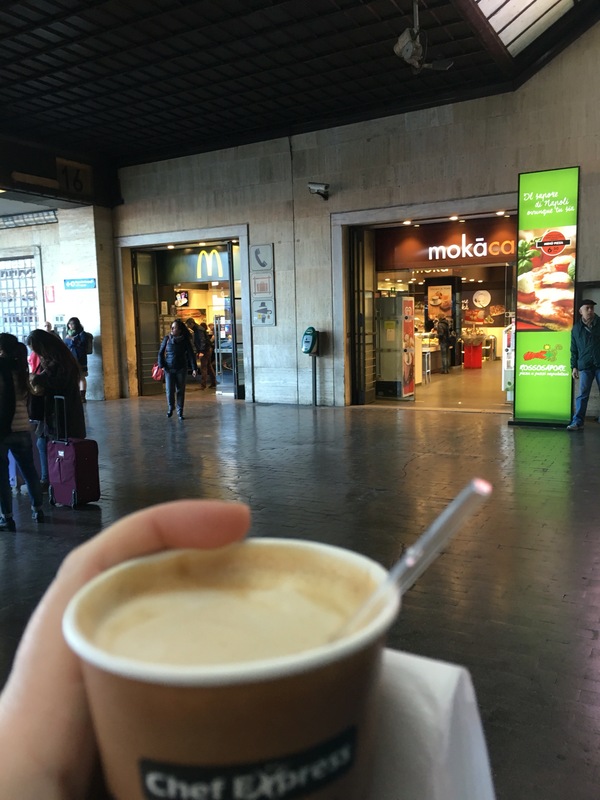 I ordered a cappuccino just so I could say I had coffee from McDonald’s while I was in Italy! We got on our train (which was a “fast train”) so it only took 1 hour and 40 minutes to get to Rome – remember to get to Assisi it took almost 3 hours (that was a “slow train” meaning it had tons of stops) and Rome is further from Florence than Assisi by distance, the one this morning only stopped one other time on the way down. When we bought these tickets there was an option to upgrade to Business Quiet for no additional cost, so we took that option, and it was the best! We sat in the first class or “executive” section, our seats reclined and we were able to sleep the whole way here without having to worry about if we would miss our stop or if someone was going to try and take our belongings! Once we arrived we bought a three day bus/metro pass that will allow us to take any metro or bus in Rome while we are here. 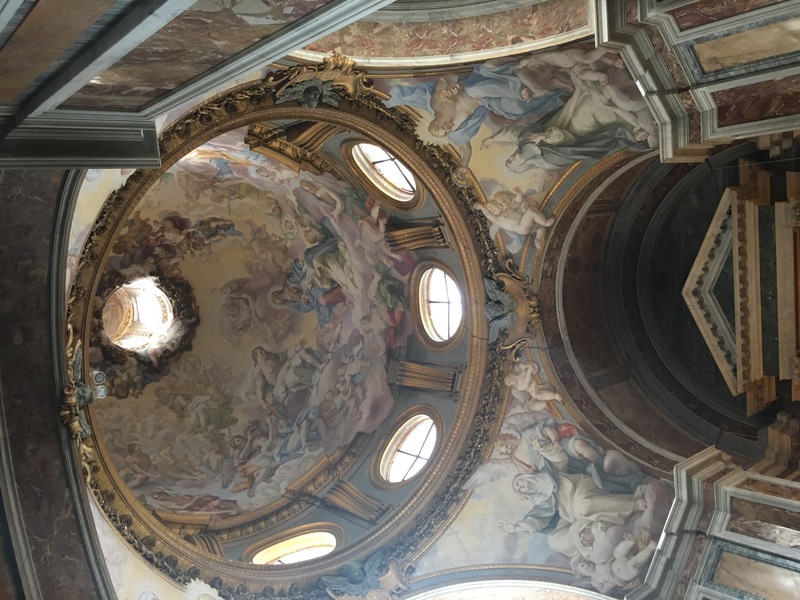 Then we took the Metro from Roma Termini (Central Station) to Ottaviano (which is the stop closest to St. Peter’s Basilica. WOW was it crowded on that metro! 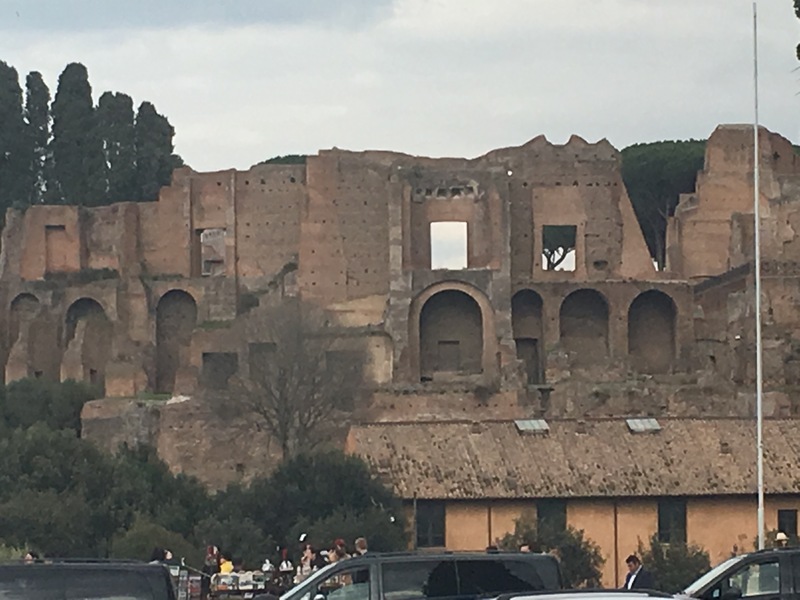 There are a ton of people here in Rome right now (which isn’t all that surprising since it is Holy Week and Easter, but it became evident just how many once we got off the metro and started walking toward St. Peter’s. 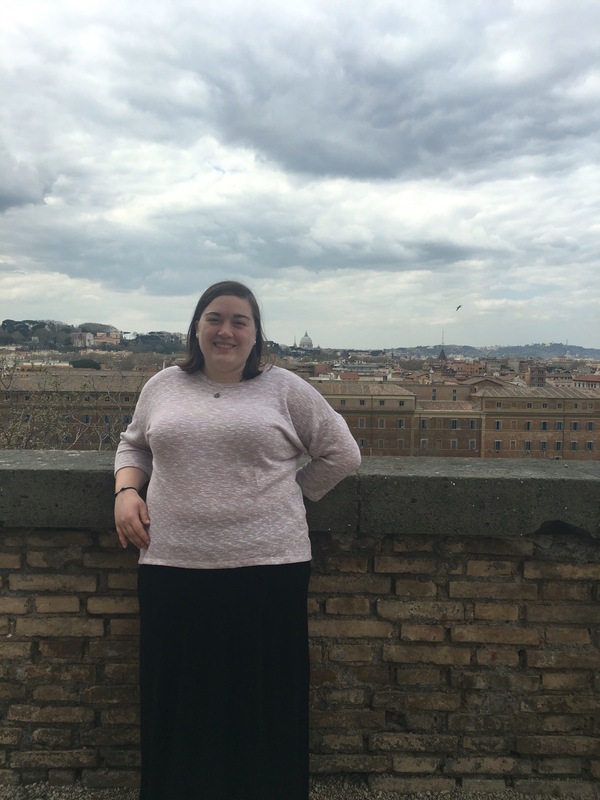 We are staying in the guest house of a convent here in Rome, called Instituto S.S. Maria Bambina and it is literally steps away from St. Peter’s Square! I swear we are on a pilgrimage, but you wouldn’t know it from the rooms we have managed to get and the deals we have found! Haha! We got settled into our room and one of the Sisters showed us around the property. 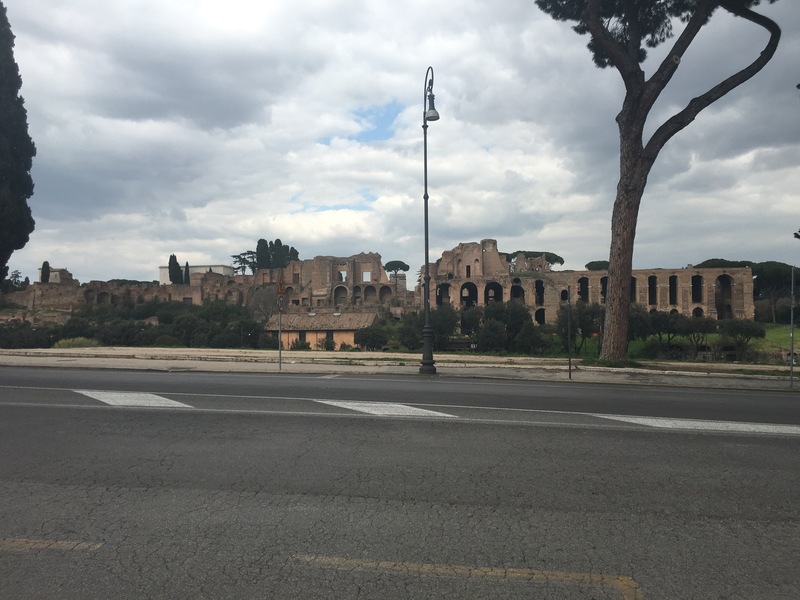 Then we made our way back to the Metro station and went to Sant’Anselmo. S. Anselmo is the “headquarters” for the Benedictine Order. Back when Leo XIII was pope, he wanted each of the marjor religious orders to have a monastery or convent in Rome and to have one person who would act sort of as an Ambassador to the Pope for that order. 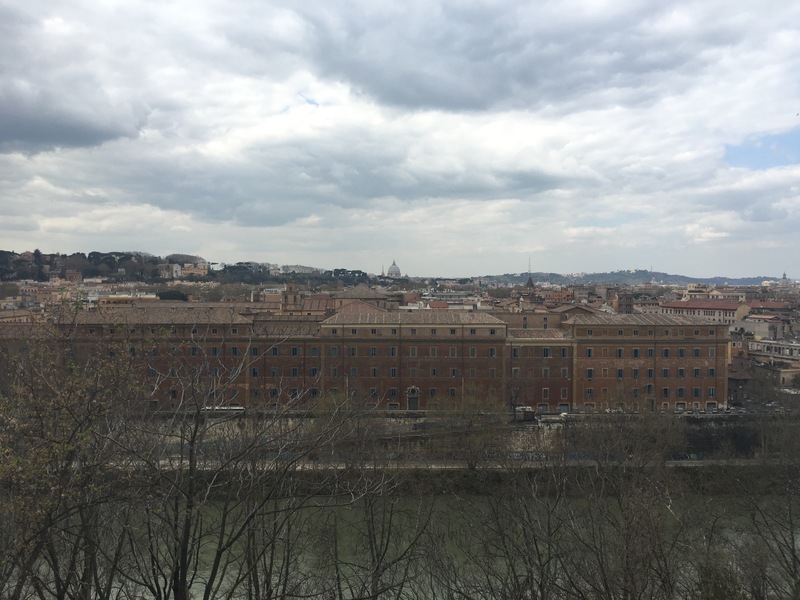 So Sant’Anselmo was built, today it is used mainly as a place for Benedictine monks to stay while they work or study in Rome. Br. Bernard is a monk from St. Bernard Abbey in Alabama, but I met him while attending Benedictine College (he was studying there at the time), and he is currently studying for the priesthood here in Rome and is staying at Sant’Anselmo. When he heard we would be in town he invited us to come visit the monastery and he showed us around. 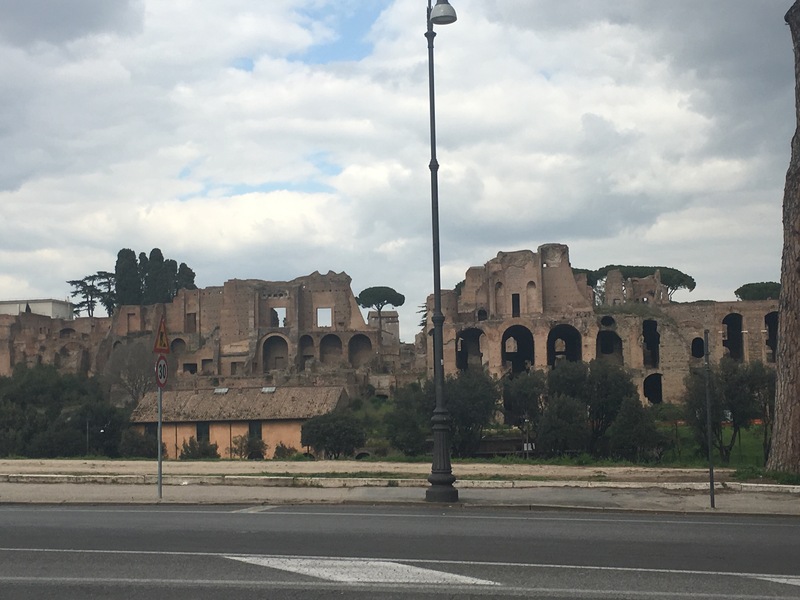 The monastery sits up on a hill that looks out over the city of Rome and is near the Circus Maximus and the Colosseum. When we got there he showed us around the monastery and invited us for lunch – there’s that Benedictine hospitality for ya! After lunch he had to start getting ready for their Holy Thursday Mass this evening and we needed to start making our way back into the city. On our way down the hill we stopped at several churches that Br. Bernard recommended. Our first stop was at the Keyhole of Malta, it is this door with a tiny key hole in it. When you look through the hole St. Peter’s is perfectly framed! I tried taking a picture but the lighting was a bit off and it really doesn’t do it justice! But believe me it was beautiful! Right next to this was an Orange Grove that had a SPECTACULAR view of the city! 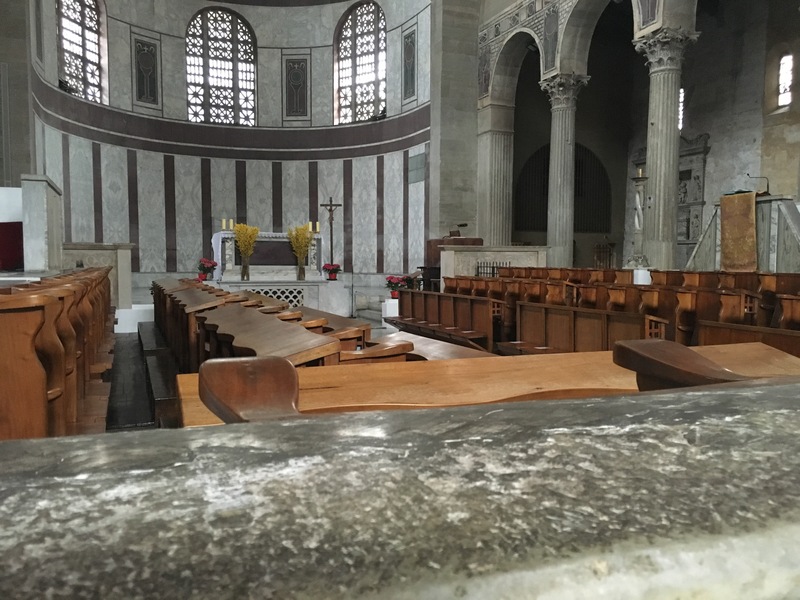 Next we went to St. Sabina which is the Doninican version of Sant’Anselmo – so the “headquarters” for Dominicans in Rome. 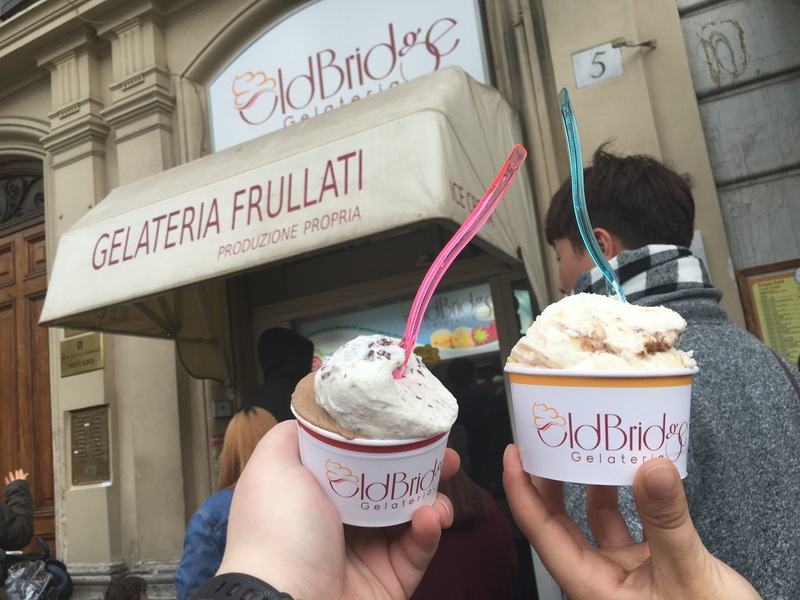 Once we were back in Rome we just HAD to stop at Old Bridge for some gellato! Old Bride is world famous and there are stories of St. Pope John Paul II sneaking out at night past the Swiss Guard to get gellato from Old Bridge! I had Chocolate Chip and Coffee, Celina had Caramel. 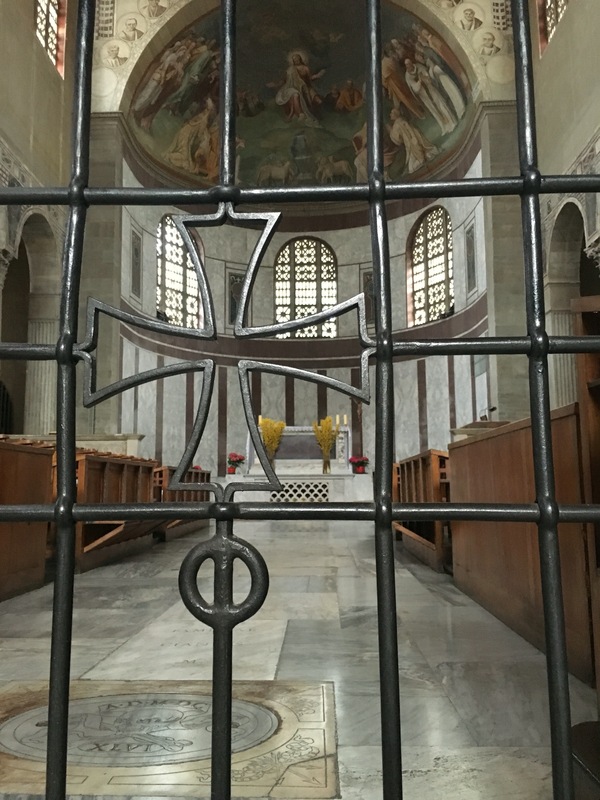 We stopped back at the room briefly to get off our feet for a bit, but it didn’t last long and we were back out the door to the Pontifical North American College (NAC), which is the Seminary that the US will send men studying for the priesthood to here in Rome. A good friend of mine, Trevor Downey is studying over here and invited us to come to Mass there tonight and Good Froday service tomorrow. On the first day of Jesus’s public ministry He ensures that the best wine will be served last. So too today, on His last day of His earthly mortal life, He serves the best wine divinity can, Himself in the Eucharist. Take this, eat and drink of my body and blood, do this in remembrance of Me – and so we have the Holy Priesthood and Most Sacred Eucharist instituted. At the end of Mass we all processed downstairs to the Altar of Repose where Jesus is kept until Easter Sunday. 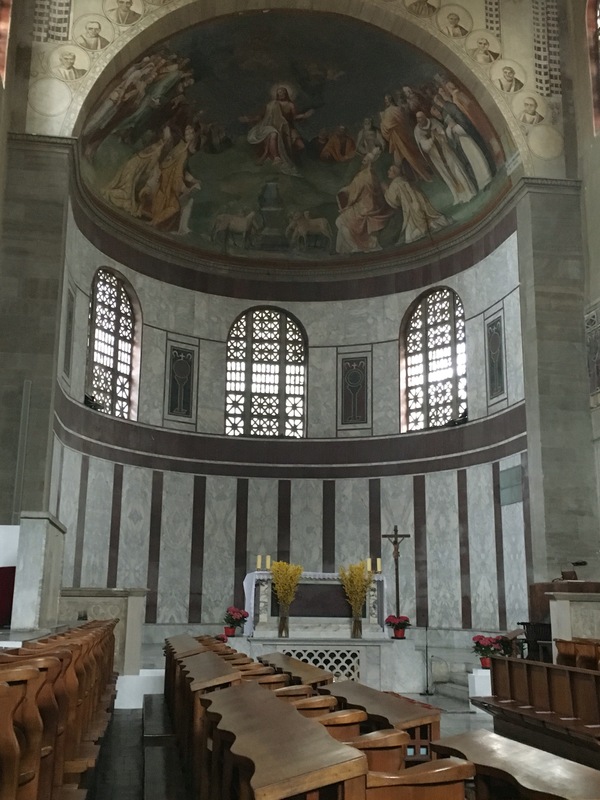 Good Friday and Holy Saturday are always a little bit of “strange” days to go into a church because the Tabernacle is open and empty, the crucifix is covered and there is no holy water – all this to remind us that Jesus has He has died and is in the tomb (but again more on this tomorrow). After Mass myself, Celina, Trevor, Nathan (another Seminarian from Kansas City), Fr. Mattingly (a priest from KC), and Bianca (a friend from KC who is here on her own) went to dinner at their favorite pizza place here in Rome (funny enough the last time I was in Rome I went to this same restaurant with the pilgrimage group!) 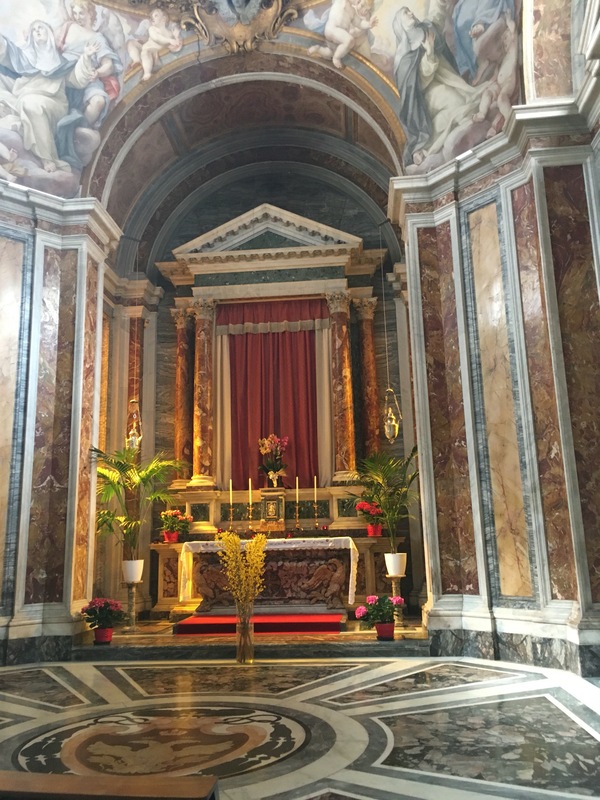 Then we made a walking pilgrimage around Rome to visit several different churches and their Altars of Repose. After we walked around for about 2 hours it was time to make our way back to the Institute (there is an 11:00 curfew since we are staying in a convent – which is probably a good thing so that we can get some good sleep since we have a long day tomorrow)! 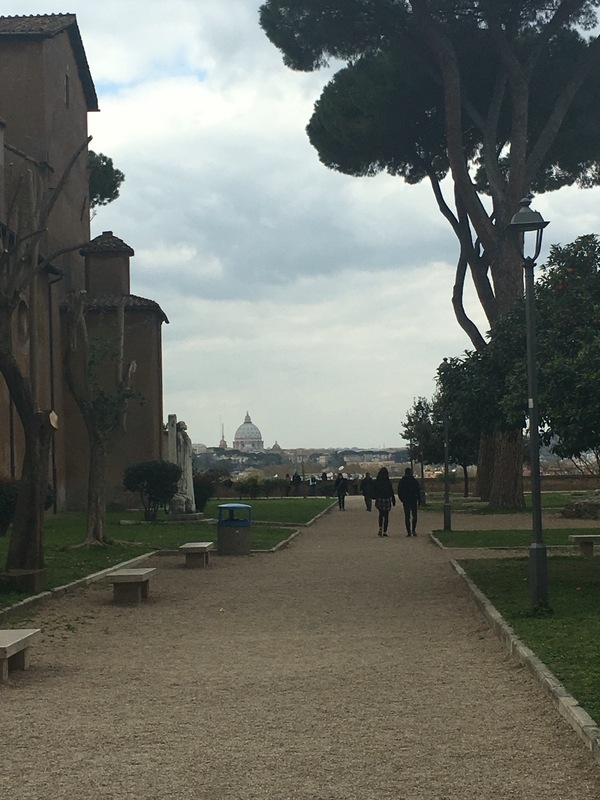 We caught a taxi back to St. Peter’s and walked the rest of the way and boy were my feet glad for the break! We walked so much today that I developed blisters on both feet 😢! 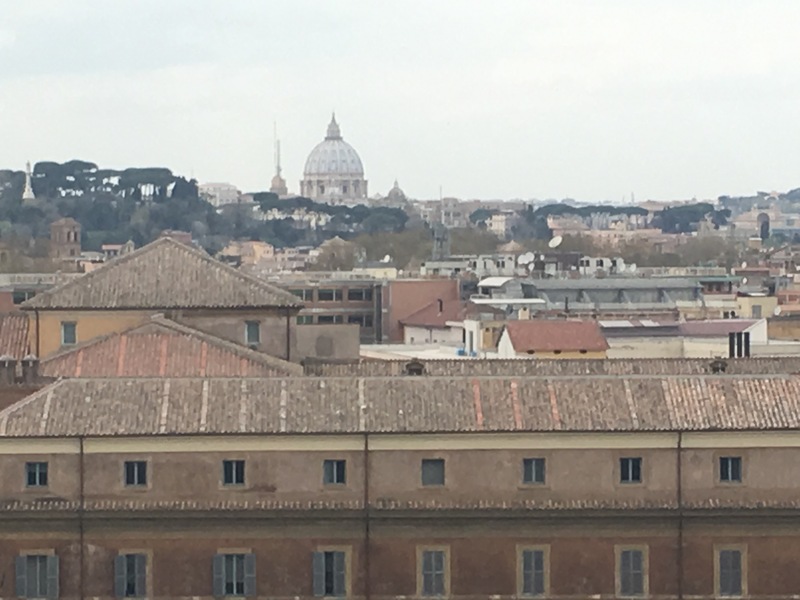 Once we got back to our room we wanted to try and find our way up to the terraces on the fourth floor that overlook St. Peter’s Square, but neither Celina nor I could remember how to get up there and we ended up getting lost inside the Institute! Don’t worry we found our way back to our room, but we will have to try again tomorrow so we can get pictures of the view! When we got back to the room we soaked our feet in the tub (yes there is a TUB in our room! I’m telling you that we have truly been blessed this trip with AMAZING rooms!) Now I am laying in bed about to fall asleep as I write this, so for now I will say GOOD NIGHT! Today I walked 27,999 steps (missed that 28,000 mark by ONE step!) That is 11.71 miles! A few new saints added to the list today, more to come for sure tomorrow! The trip sounds awesome and I’m learning a ton. Can’t wait to keep up with you through the weekend. Love ya! I’m enjoying each update and couldn’t be more proud of you. May God bless you and keep you safe. I love you. I get in bed every night and open up my email to see what amazing things you did today! Uncle Joe and I have thoroughly enjoyed your blog and feel like we are on the trip with you! Thank you for taking the time to share all your amazing experiences with us! We are giggling about the one step short of 28,000, and Uncle Joe says,” man she should have got up and walked around the room” ,,,I’m with you, I would have just went to bed after that day! I love you, be safe!